The most common complaint in patients diagnosed with De Quervain’s Syndrome is radial sided wrist pain, in the area of the first dorsal compartment of the extensor retinaculum. This compartment contains the Extensor Pollicis Brevis (EPB) and Abductor Pollicis Longus (APL) tendons. In this syndrome, hypertrophy of the retinaculum and thickening of the synovium has been noted. Forceful, prolonged and/or repetitive motion of thumb abduction and ulnar deviation; motions involved in many functional activities; may contribute to the syndrome. Pregnant women and mothers of young babies often are vulnerable. The Finkelstein test (thumb held in palm and wrist strongly ulnarly deviated) typically elicits pain, localized to the radial styloid. Conservative management of the De Quervain’s Syndrome includes activity modifications and orthotic wear although there is no strong evidence or studies to support the use or benefit of orthoses. However, a consensus study published by the European Hand Guide study in 2014 indicated that patient education, splinting/orthoses, NSAID’s and injections were all key components of the conservative management of this diagnosis. A recent study by Nemati and colleagues from Iran compared two different orthoses for management of symptoms in twenty four women with acute De Quervain’s Syndrome: a long opponens orthosis versus a hinged version of the long opponens orthosis that permitted wrist extension and flexion, but blocked radial and ulnar deviation. Although the testing period for this study was relatively short (2 weeks), all patients demonstrated decreased pain and increased strength and function. However, the group using the hinged orthosis demonstrated a significantly increased VAS (visual analogue scale) on a 100 point satisfaction scale for the treatment. Although no fabrication instructions are offered for the hinged orthosis utilized in the study, we decided to try fabrication of this hinged long opponens orthosis. Instead of the wings and a rivet, we elected to use rolled Orficast as thermoplastic hinges. 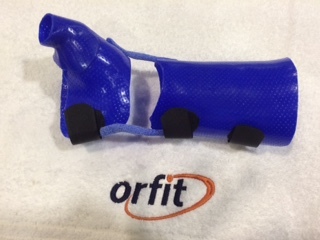 (1) Starting with the Orfit Colors NS pre-cut for immobilization of the thumb and wrist, make a long opponens orthosis and apply straps. 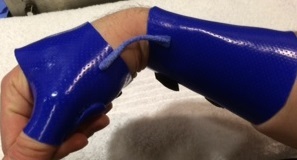 (2) Mark the wrist axis of motion and cut the orthosis into two parts. (3) Using two rolled pieces of Orficast as hinges, reattach the two parts along the radial border and ulnar borders. 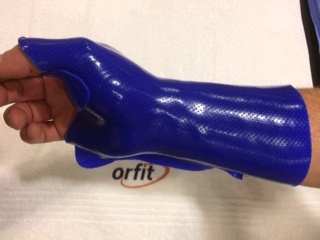 (4) The patient was able to flex and extend the wrist in the orthosis, but was unable to move radially and/or ulnarly. This ability to move the wrist in a limited way allows for increased hand function. Therefore patients are more likely to be satisfied and hopefully more compliant with orthotic wear. 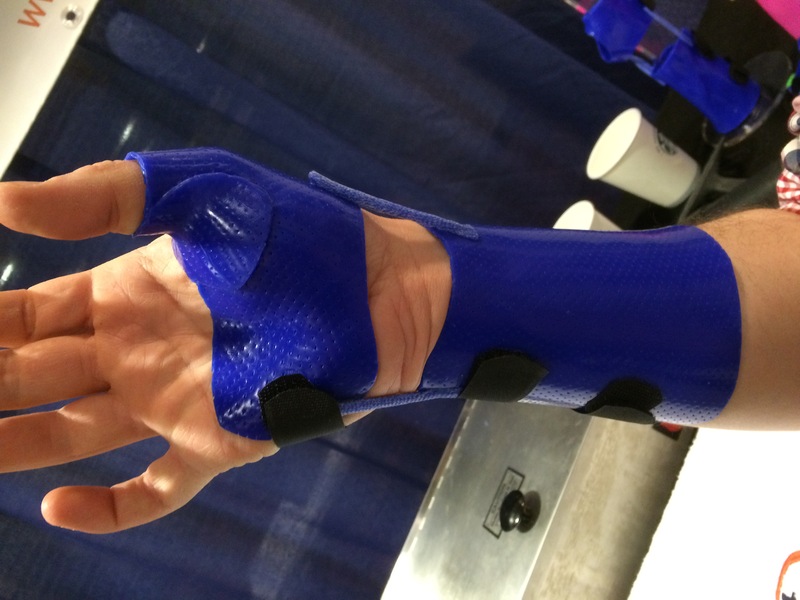 Blocking radial and ulnar deviation prevents increasing tension on the already aggravated tendons of the EPB and APL. Huisstede, B. M., Coert, J. H., Fridén, J., & Hoogvliet, P. (2014). Consensus on a multidisciplinary treatment guideline for de Quervain disease: results from the European HANDGUIDE study. Physical therapy, 94(8), 1095. Nemati, Z., Javanshir, M. A., Saeedi, H., Farmani, F., & Aghajani Fesharaki, S. (2016). The effect of new dynamic splint in pinch strength in De Quervain syndrome: a comparative study. Disability and Rehabilitation: Assistive Technology, 1-5. The protection of your personal data is our priority. Thank you for subscribing to one of our newsletters. We would like to invite you to share some personal data with us. The protection of this data is our priority. By submitting this form, I agree to the processing of my data to receive personal messages by mail. You can change your mind at any time by clicking the unsubscribe link in the footer of any email you receive from us, or by contacting us at welcome@orfit.com. We will treat your information with respect. For more information about our privacy practices please visit our website. By clicking below, you agree that we may process your information in accordance with these terms. Orfit Colors NS offers beautiful metallic and bright colours. Coloured products are highly recommended if you are looking for new ways to boost your patients' morale, make them feel good and improve compliance with splint wear. 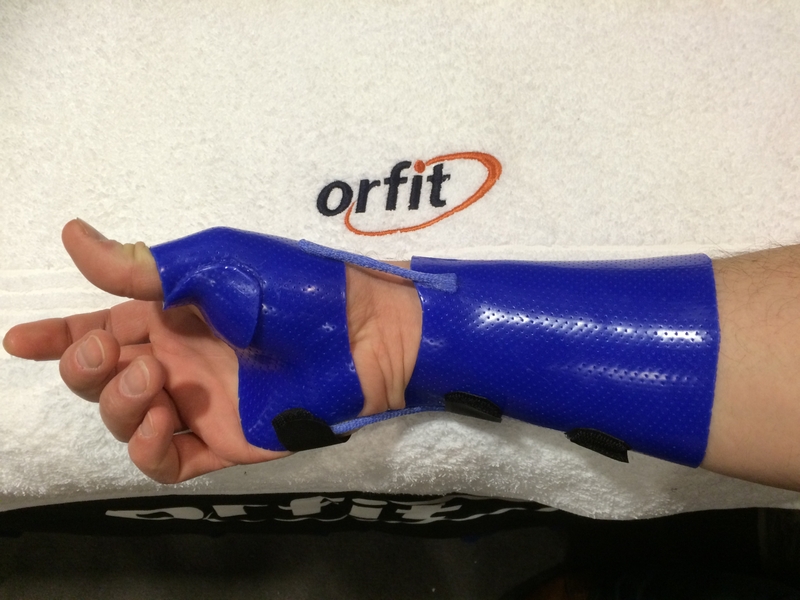 Orficast is a unique textile-like thermoformable taping material. It offers extreme comfort for your patients and is very easy to use. This knitted hybrid fabric is ideal for all applications of finger and/or thumb orthoses and supportive bandage wraps. 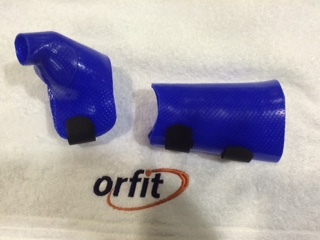 If you find yourself fabricating the same type of orthosis over and over again, you should check out Orfit pre-cuts. 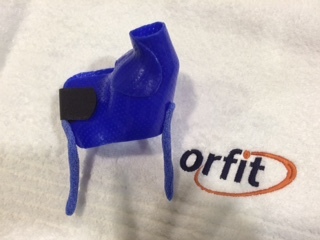 What Does Your Patient Think About Their Orthosis? Before fabrication of any orthosis, therapists must have a clear understanding of the involved anatomy, how the diagnosis affects the anatomy and what the prescribed orthosis can do to alleviate pain and/or assist in the healing process. The patient’s preferences for coloured materials and/or straps, perforated materials or solid materials, designs and/or decorations should also be taken into consideration. However, this might not even be enough. Musicians may experience different types of repetitive strain or overuse injuries. Some may even have to stop playing their beloved instrument due to these issues. Fortunately, there are a number of ways in which therapists can help musicians. They can provide custom orthoses which may be very beneficial to both professional and amateur music makers.